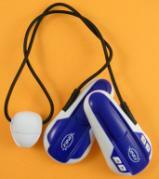 The SwiMP3.1G waterproof MP3 player allows you to listen to hours of your own music during your swim. Its the best underwater mp3 player for swimming on the market. Its lighter, smaller & more discrete in the pool than its predecessor. The SwiMP3.1G costs £99.98 and can be used with all swimming strokes and is designed to be comfortable used with all types of swimming goggles. Although not essential it is recommend a maximum goggle strap width of 1 inch (25 mm) be used for easy alignment under the strap clips. The pack includes a SwiMP3.1G player and an easy to use waterproof MP3 control panel. Carrying case and instruction manual. All overseas customers must pay an additional postage charge. Please see our Non UK Customers page. The SwiMP3.1G waterproof MP3 player offers a truly joyful swimming experience. Imagine listening to hours of your own music during your swim session. The SwiMP3.1G offers exceptional underwater MP3 sound quality. Standard waterproof mp3 players rely on the transmission of sound through air or water causing the swimmer to be reliant on the quality of their earplug seal. Any break in the earplug seal means that water enters and causes the sound quality to become muffled. However the SwiMP3.1G uses bone conduction - the direct transfer of sound vibrations from the cheek bone to the cochlea in the inner ear - to provide the swimmer with exceptional sound clarity. The new SwiMP3.1G is revolutionary in that it relies on bone conduction of sound. When the device is placed on any bones of the skull (e.g. the cheek bones) it leads to vibration of the fluid in the inner ear. Thus swimmers can enjoy clarity of sound underwater with the SwiMP3.1G device that was never before possible. Finis's SwiMP3.1G brings an inspirational experience to swimmers either while working out or taking a leisurely swim. Bone conduction hearing is an innate sensory capability that the new SwiMP3.1G leverages to enhance the experience of swimmers, triathletes, surfers, synchronized swimmers and anyone involved in general water activities. It is a safe, reliable and proven technology that the SwiMP3.1G offers to the wide range of watersports enthusiasts. The SwiMP3.1G is specifically designed for swimming. You can also easily add songs to your SwiMP3.1G (without using SwiMP3.1G Media Manager) by dragging & dropping your MP3 files directly to the SwiMP3.1G as Windows File Explorer designates the SwiMP3.1G a removable drive e.g. [E:Drive].